lattice work, scraps of coquillage were introduced, though generally kept well within bounds, as the illustrations will indicate. 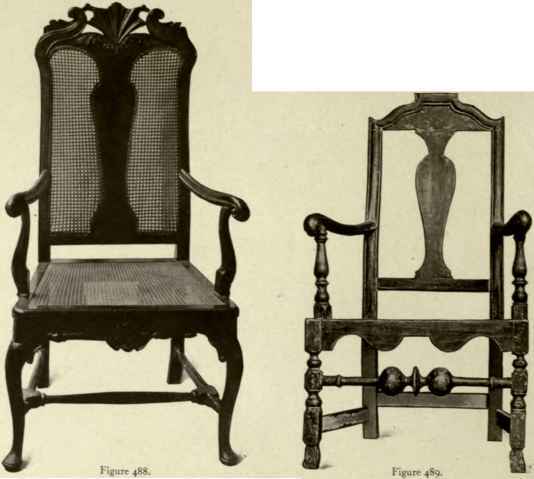 In dealing with cabinet work Chippendale found that it was not so easy to impart to his productions the desired Chinese character as when dealing with chairs. The respective conditions controlling the construction of both were by no means the same. In chairs he had what was to all intents and purposes a mere framework of wood, the open spaces of which could be filled with any decorative detail that his fancy might dictate. This framing formed a perfect setting for the lattice work of which he made such good use. But with cabinets, chests, and other articles of that description the case was very different. In these, plain filled-in expanses had to be treated instead of open spaces, and for such the ordinary lattice, by reason of its very nature, was of but little use. Notwithstanding the fact that the lattice itself could not be requisitioned, it was obviously essential to secure a similar effect by some means or another if the Chinese character were to be retained. Chippendale surmounted the difficulty with great ingenuity. 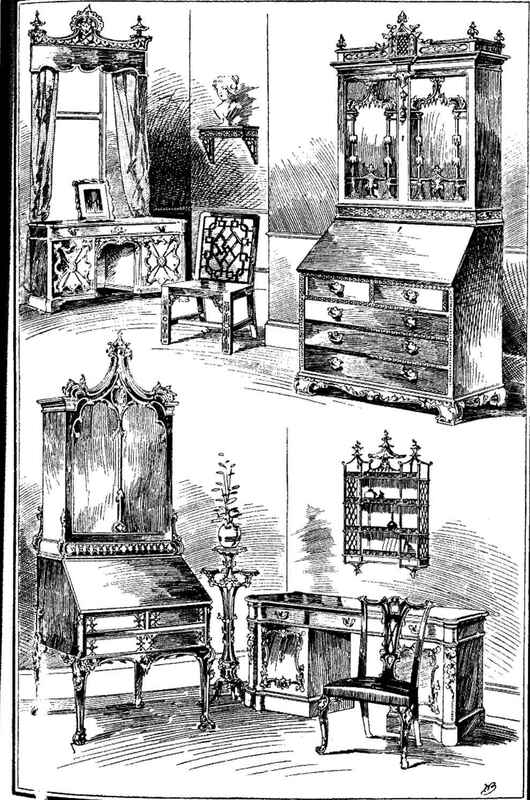 He sketched-out his lattice-like patterns for the enrichment of cabinet work, but made them much „ more delicate and intricate than those intended for the backs and arms of chairs; he then had them cut, by means of the fret-saw, in thin mahogany. This, of course, was far too fragile to stand without a supporting background of some kind; it was therefore "planted-on" or "applied" to the solid foundations afforded by the wood with which the spaces to be decorated were already filled-in, and was firmly fixed in position there by means of " pins" (tiny nails or " brads') and glue.